The Virgen de Guadalupe is an apparition of The Virgin Mary, the most important female figure in the Catholic faith and the mother of Jesus Christ of Nazareth. Her story starts at the dawn of Spanish colonial Mexico, where indentured indigenous peasant found themselves trapped between the century-old dogma of the Aztecs and the newly presented Christian religion of the Conquistadors. On the morning of December 12, 1531 Virgin Mary appeared to Juan Diego Cuauhtlatoatzin, according to legend, and told the enslaved "Nahua" native to build her a church. Speaking to him in his indigenous tongue, the story goes, she asked for a church to be built at the Hill of Tepeyac, near Mexico City, in her honor. Guadalupe would appear five more times in some versions of the story, each time encouraging the peasant or helping him fight the odds of Catholic bureaucracy. When Juan Diego tells of his encounter with Virgin Mary to the Spanish Archbishop of Mexico City, Fray Juan de Zumárraga, the priest instructs him to ask the Holy Mother for a sign to prove her identity. The Virgen de Guadalupe then heals her loyal servant’s uncle of a malady, and instructs him to collect flowers from the top of Tepeyac Hill, where she produces another miracle. It’s December, and despite the cold and the dry climate, Juan Diego returns to the initial site of the apparition to find a field of flowers in full bloom. He spots Castilian roses -- a symbol of the conquering power of Spain, and the Virgen de Guadalupe then arranges these in Juan Diego's tilma (peasant cloak.) Diego returns to Zumárraga, opens his cloak, and lets the the Castilian roses cascade on to the floor. Not finished yet with her miracle spree, the Virgen de Guadalupe imprints her radiating image on on his personal tilma . Juan Diego's tilma is displayed in the Basilica of Our Lady of Guadalupe, which sits on the top of Tepeyac Hill in Mexico City. The day that the Virgin graced his cloak and showered him in Castilian roses, December 12, is celebrated by Mexican and Central American Catholics. The most iconic image of the Virgen de Guadalupe is housed in the Basilica of Our Lady of Guadalupe in Mexico City, but reproductions have been spread throughout the world. That includes Spain, where pre-colonial “Virgen de Guadalupe” predates the Mexican incarnation, and drew prayers from many of the Catholic conquistadors that left the province of Extremadura for the new world. Interestingly, the arab influence on Extremadura left its mark on the name of the virgin herself. The word guadalupe is an amalgam of the Arabic word for valley and the Latin word for wolf. Millions of visitor flock each year to the Basilica where Juan Diego’s tilma is. Some even say it’s the second-most visited Catholic church behind. St. Peter's Basilica in the Vatican. The image has had a lasting impact on Mexican culture and the Catholic culture as a whole. The tilma upon which the image is imprinted has remained structurally intact for over 500 years. In addition to its maintained integrity, the tilma seems to repair itself. On November 14, 1921, a bomb damaged the altar of the Basilica of Our Lady of Guadalupe, however the image was seemingly unscathed. Roman Catholic faithfuls believe the image possesses miraculous abilities. In 1929 and again in 1951, photographers perceived a figure reflected within the Virgin's eyes. Believers say that the image reflected seems to be the face of a bearded man, maybe Juan Diego. The Catholic Church has embraced the indigenous piety of Juan Diego in modern times. The Vatican beatified him in 1990 and canonized him 2002, making him the first indigenous American saint. Who Is Juan Diego, Indigenous Saint Who Saw Virgen De Guadalupe? 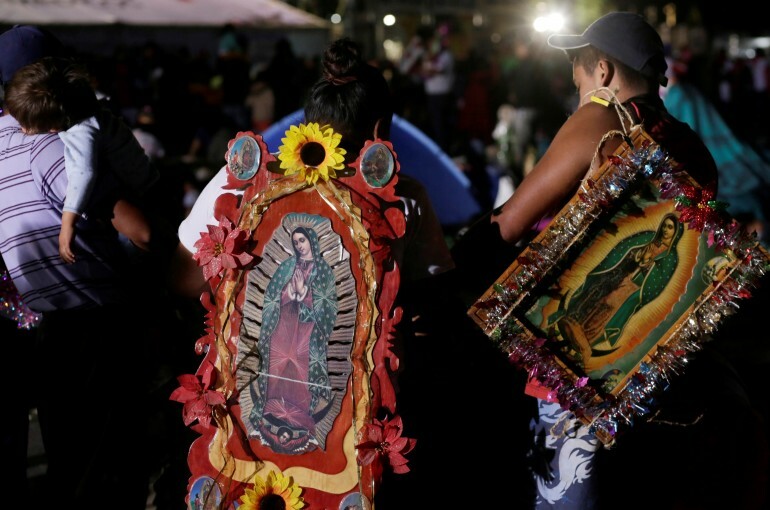 Why Is The Virgen De Guadalupe So Important In Mexico?